Butter on toast is one of the simple things that many people miss when giving up dairy. The thought of a slice steaming with melted butter does indeed set off the salivary glands ... but there is no need to miss this experience completely. Try nut and seed butters instead. They can be bought in most supermarkets now or if you have a Champion (or similar) juicer, or a good coffee grinder, you can make them yourself. When buying them in a supermarket make sure they are just nuts and seeds, some brands have palm fat added, which is not sourced ethically. Seed and nut butters are generally a good source of essential fats, proteins and minerals. 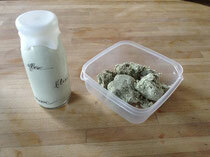 Pumpkin seed butter tastes stronger than some of the others, so that one can take a bit of getting used to. I like it with more savoury dishes, like poached eggs. Pumpkin seeds are well known as an excellent source of Zinc, so a good food to add on a regular basis, in any form. Cashew butter is very sweet and quite mild and is a great all round substitute. Cashews are particularly high in Magnesium, Copper and Manganese. 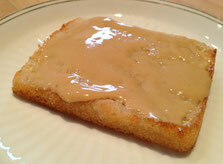 Tahini is also excellent and high in Thiamin, and a wide range of minerals, including Magnesium, Zinc and Manganese. The favourite combination in our household is with Dalfour Wild Blueberry Jam (no added sugar only fruit sugar) on a piece of ABO white rice toast, or in rice and oat flour pancakes with some honey and lemon. Enjoy!! Note: As with all foods, there can be allergies or intolerances to nuts and seeds, so I usually advise introducing any new foods slowly and in small amounts. I generally observe that patients find nut and seed butters easier to digest than whole nuts and seeds. Difficulty digesting nuts can often be due to not chewing long enough and smaller protein chains not being available for the relevant enzymes to act on them. It can also be due to general enzyme insufficiency. However, if there is an allergy or intolerance, then the same reaction will occur in the processed form. When tolerated well, though, nuts and seeds are an excellent and well balanced nutrient source. There are some concerns regarding low iodine levels when cutting out dairy, this can easily be remedied by adding more seaweed into the diet. Seed and nut milks are a great alternative to dairy and you can decide yourself how creamy you like them. Basically, the more seeds/nuts are added to the water the thicker it will become. It's so simple.. 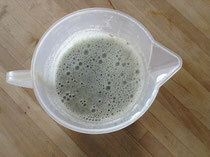 Mix seeds and water well with a food blender or mixer. Strain either with a sieve or a jelly bag- the latter generally produces a finer milk and enables you to get more liquid out of the pulp. Finished! You can use the milk as you would use normal dairy in teas, crereals, to make sauces etc. Some harder nuts like almonds are often better when soaked overnight- discard the soaking water and use fresh water to produce the milk. To give yourself an additional protein boost, add a teaspoon of pea protein powder. 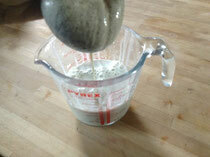 Use the pulp to make burgers, in salads (see Pumpkin salad recipe), to bind sauces, in pancakes.